This is not an introduction to XMPP, but to how poezio works. Poezio is an application that has three main layers, mostly separated in three different python modules: core, tabs, and windows. An UML diagram of Poezio would be inneficient, cluttered, or incomplete, so there is none, if that bugs you. Core is mostly a “global” object containing the state of the application at any time, it contains the global commands, the xmpp event handlers, the list of open tabs, etc. Most objects in poezio have a self.core attribute referencing the Core (it’s a singleton, so there is never more than one instance). Core also contains the main loop of the application, which then dispatchs the I/O events (keypress) to the appropriate methods. But the main loop is not the most important thing in poezio; because it is an IM client, it is essentially event-driven. The event part is handled by slixmpp, which is our fork of sleekxmpp to use asyncio instead of threads. 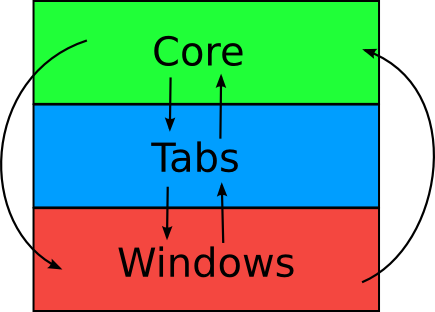 Tabs are the second layer of poezio, but the first dealing with the UI: each Tab is a layout of several windows, it contains tab-specific commands, tab-specific keybinds, and it has methods in order for core to interact with it, and some methods are only proxies for the methods of a window. Example scenario: If someone presses the key PageUp, then Core will call the appropriate method on the current _Tab_, which will in turn, if it implements the method (inherited empty from the Tab class), call a scrolling method from the appropriate window. All tabs types inherit from the class Tab, and the tabs featuring chat functionality will inherit from ChatTab (which inherits from Tab). The events handlers are registered right at the start of poezio, and then when a matching stanza is received, the handler is called. The handlers are in Core, and then they call the appropriate methods in the corresponding tabs. Example scenario: if a message is received from a MUC, then the Core handler will identify the Tab, and call the relevant handler from this Tab, this tab will in turn, add the message to the buffer, which will then add it to the relevant windows. All the _windows_ that deal with received or generated text are linked to a text_buffer, in order to rebuild all the display lines from the sources if necessary. This also enables us to have several windows presenting the same text, even if they are not of the same size and layout. Commands are quite straightforward: those are methods that take a string as a parameter, and they do stuff. However, when creating a command, you will deal with _one_ str, no matter what. There are utilities to deal with it (common.shell_split), but it is not always necessary. Commands are registered in the commands dictionary of a tab structured as key (command name) -> tuple(command function, help string, completion). They take an Input (a _windows_ class) as a parameter, named the_input everywhere in the sources. To effectively have a completion, you have to create a poezio.core.structs.Completion object initialized with the completion you want to call (the_input.auto_completion() or the_input.new_completion()) with the relevant parameters and return it with the function. Previously you would call the function directly from the completion method, but having side effects inside it makes it harder to test. Set the input to iterate over completion_list when the user hits tab, to insert after after the completed item, and surround the item with double quotes or not. To find the current completed argument, use the input.get_argument_position() method. You can then use new_completion() to select the argument to be completed. You can look for examples in the sources, all the possible cases are covered (single-argument, complex arguments with spaces, several arguments, etc…). Only new_completion() used together with get_argument_position() allow completing arguments that are not at the end of the command line, therefore it is preferable to use that and not auto_completion(). For convenience’s sake, poezio includes a decorators module containing a command_args_parser, which can be used to filter the input easily. See the source of the CommandArgParser for more information.